The construction of the southeastern part of The Temple Mount is artificially built of refillment works and arches. Located in this area are long underground halls, the most famous among them being Solomon's Stables and the Double and Triple gates. It is possible that similar arches exist to the west of [southern end of] the Temple Mount but there is currently no access to this area. It is traditional to attribute this valuted construction to extensive reconstruction and leveling works that were carried out by Herod at the Temple Mount, however additional changes were carried out in this area at a later period. Among other reasons, the object of building arches was to decrease the pressure on the supporting walls, and to elevate the platform above the bedrock. But others have argued that the reason for the [system of arches] was to overcome the problem of isolating [defilement of surface buildings] by the dead who might be buried below in "the graves in the depth." (Mishnah, Tohoroth, 3). Herod carried out extensive works in the Temple Mount therefore doubling it's surface area. These projects demanded much work mainly because of topographical difficulties in the south-east part of the Temple Mount. In this [southern] area the bedrock slopes down to the Kidron river 47 meters below the Temple Mount in elevation. Herod managed to overcome this problem by filling the area behind the walls with soil up to a height of 30 meters. Onto this leveled area were built vaults and pillars which supported the south-eastern court of the Temple Mount platform. The building of pillars in turn created underground halls some of which in time came to be known as "Solomon's Stables." The length of these stables is approximately (30 meters from east to west, and 60 meters from south to north). Their height is an estimated 9 meters and the floor is l2.5 meters lower than that of the Temple Mount court. This extensive construction work was supported by the Temple Mount wall which is approximately 47 meters in height. However, due to the covering and build up of refuse, the south-western corner of the wall can only be seen up to a height of 29 meters. The halls are a make up of decorated rows which are connected one to another by wide and rounded arches. These arches are 1 meter thick and made of a coarse stone and are partly of secondary use [reused masonry]. Some of these bear Herodian building characteristics of cut even margins and a flat central boss. It is assumed that most of the work was carried out by Moslems after the Moslem conquest. The underground halls are made of 12 pillared avenues which differ from one another in length. The northern wall contains a gem stone, which may have been used as a gate's frame during the Second Temple period. Here and there can be seen traditionally decorated stones, which are typical of the Crusaders. The surface [of the floor of the stables] slopes moderately from west to east. The surface of the south-eastern corner was raised during renovation work carried out at the site in 1890. As a result "The Singular Gate" (which is blocked), was covered up to the height of the upper arch. From the Crusader period this area benaeth the southeastern platform of the Temple Mount [see map] has been named Solomon's stables. The name has a mythical connection to Solomon which shows the great intensity and lasting impression that this place had upon the Crusaders. Solomon's stables were connected to this king just as were the Golden Dome (associated by the Crusaders with Solomon's Temple), and El-Aksa (associated with Solomon's palace). However, the Arabs did not preserve the names "Solomon's palace" and "Solomon's temple" because they wanted to destroy any remnant of the Crusaders occupation of the site. Due of the impressive construction of these stables and the mystique surrounding them, Solomon's stables are an important part of popular Muslim tradition. Their myth has it that there was a need for "the Jinn intervention" (a demon), so this demon carried the massive stones to their place. "This was carried out according to Solomon's order," it is said, because he "was known to rule over all the demons." H. DeVogue tells of the great number of stones that the pilgrims customarily left at this location (Solomon's stables) "so as to dominate the Demons that the eastern imagination determined their place amongst these dark pillars." From the Herodian period and until the 20 century there does not exist any clear information about this site. Most Muslim sources prior to the Crusader period relate almost entirely to the site called "Jesus' Cradle" [or, "the Cradle of Jesus"]. In the Crusader period the underground chambers were mostly used as stables for the Crusade knights. They most probably opened a special gate in the northern wall to let the horses enter in. The holes and notches in the arches used for tying up the horses and the troughs, (situated close to the northern wall), found here, prove that this location was used as stables. According to Johanan from Wierberg in his account, "at the descent from the road there is a large gate, through it one can enter to the Temple's court. On the right, to the south is a temple which from what has been told, was built by Solomon. There, are large stables which can hold more than 2000 horses (two thousand), or 1500 camels. In this place the Templar knights own many large houses and a new church which has not been completed. They own much property and wealth here, and in other places." Solomon's stables were additionally mentioned by the Jewish pilgrim Benjamin from Tudela: "and there in Jerusalem were stables in a house that belonged to Solomon, who built an extremely strong building from large stones, there was not to be seen such a building in the whole world." Moji'r Al Din described this site at the end of the 15th century: "Solomon's stables...below the court area, under a plot of planted trees lies a large and beamed underground area named Solomon's stables, this area stretches beneath most of the court, it seems that this building is from the days of Solomon...."
Apparently this site was not generally used by the Moslems. They visited it only occasionally, this fact can be concluded from Felix Fabri's description who secretly entered it through an opening in the wall (the eastern wall) with the assistance of a Jewish guide, "both the Jews and the Arabs state that the underground chambers were used as Solomon's stables, however it is accepted that here were stored the perfumes that Solomon received from the Queen of Sheba..." (I Kings l0:10). "It is unacceptable that Solomon would stable horses so close to the Temple as this would be seen disrespectful. In addition, Solomon built elsewhere cities for chariots for the use of iron chariots, the horses and the horsemen. In Solomon's stables were many piles of stones. Our guide explained that the Jews place these stones, so that when the day comes for them to settle in the Land of Israel, these sites would be reserved for them...above the vaults lays an opening which through the Moslems throw all the dirt that they sweep from the Temple Mount...during our visit we were in great fear, for if the Muslims were to discover us, we would come to a bitter end. If it were not for our fear we would have climbed on the piles of dirt so as to reach up to the Court of The Temple Mount....and so, after we saw it all, we returned to the opening that we had entered through and circled Mount Moriah." Jesus' Cradle is located to the Northern corner of the court at the entrance to Solomon's stables. This site is a small rectangular room (4.40 x 7.40 meters) which is used as a place of Moslem worship and named "Sidna Issa" (Jesus' Cradle). The floor height of this location is 6.40 meters below the Temple Mount's surface. One descends to this area by a winding staircase containing 32 stairs. The eastern wall contains two alcoves that in the past were used as windows but which are presently blocked. An additional alcove has been opened and is used as a window. The room's vaults originate from a relatively later period and are made of small stones. On the floor of this site is found a marble alcove originating from the early Byzantine period when it was possibly a setting for a statue of some sort. This alcove is arched in shape and refined at it's borders in the shape of a conch shell, (1 x 1.60 meters). The "Jesus' Cradle" is related to this stone. According to tradition, this location is where Jesus was laid down by Miriam after he was presented in the Temple at the age of 40 days. Above the "cradle" is a dome supported by four marble pillars made by the Moslems, who worshiped Jesus as a prophet, and claim this place as given to them by the Christians. In the western wall was situated a door which blocked the way to Solomon's stables. According to the decorations on this door it is related to the Byzantine period. Upon the request of the Duke from Makelnberg, who visited here in 1874, this site was opened and has remained so ever since. The name "Jesus' Cradle" indicates that this location was considered holy by the Christians and it is possible that here stood a church. According to Johann from Wiersberg's statement, "close to The Templar's building, to the east of the city walls was Simon the Zaddik's place of dwelling. It is told that here he customarily hosted Miriam and Jesus in great honour, and gave them to eat. This is what he did the night after Jesus was 40 days old, and then presented him to the Temple. Simon's dwelling became a church, where Simon buried. Below this area is a crypt where the wooden cradle of the highly worshiped Jesus is reserved." Jesus' cradle was mentioned by many Moslem authors prior to the Crusader period. Abad Rabia stated in the year 913 AD, "In the Temple mount are situated the alcoves named after Miriam, daughter of Amram, the mother of Jesus, where the angels were accustomed to hide her winter fruit in summer, and summer fruit during the winter." Mojir A-Din, adds some important facts about Jesus' cradle, "Beneath this place which is known as the Alcove of Knowledge, there lies an underground mosque by the name of Jesus' cradle. It is told that this location is the Alcove of Miriam and her place of worship To this place arrive many pilgrims to pray and to confirm that their wishes are fulfilled The prayer here reads the chapter of Miriam (Sura No. 19), and then added to this, while kneeling, is said The Saad Omar Sura, and the prayer said by Jesus when they took him to The Mount of Olives." The Triple gate is situated approximately 90 meters from the southeastern corner of The Temple Mount, and an estimated 63 meters from The Double Gate. The shape of this gate like it's name the "Triple Gate," originated from relatively late period. In the past the gate's pillars were short and supported upon them, were lintels instead of arches. The gate is approximately 14.5 meters wide and similar to the Double Gate. From the three gates continue, northward, underground halls, which are shaped according to the external part and create the Porch of the Gate. The eastern wall of the gate is also the western wall of Solomon's stables. 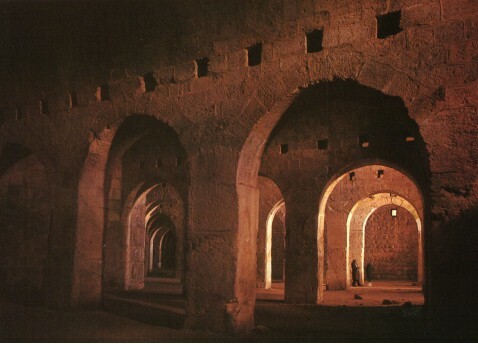 The halls are situated an estimated 12 meters beneath the Temple Mount surface. In the past there existed a slope that moderately led up to the Temple Mount Court area. Near this relatively late building can be seen the ruins of an original Herodian period construction. At present the halls and the gate are completely blocked from the inside and outside. The Porch of the Gate has not preserved well, from the pillars and alcoves that once existed here exist to the west only poor remains. From The Porch of the Gate there lead northward two vaulted underground passageways which measure approximately 62 meters in length. Access to this site is blocked from the south. At present access to the halls of the Triple gate is additionally possible through an opening in Solomon s stables. The layout of The Porch of the Gate represents the many changes that have been made on this location. Among other changes made here, the eastern part of the opening has been shortened by 12 meters. (October 20, 1996). The wall from the south-eastern corner to the south-western (at Mount Zion) is 1100 m long. The recent excavations at the southern wall, carried out by Professor B. Mazar and Mr. M. Ben Dov disclosed signs of five periods of construction. The lower courses are Herodian, with the characteristic fine dressing, double margin and slightly prominent smooth boss. Next are the large blocks, smoothly dressed, apparently dating to Aelia Capitolina. These are surmounted by smaller, smooth stories, alternating with discs (cross-sections of columns inserted in the wall) which are probably Mameluke. This section is interspersed with small blocks having very prominent bosses and margins, apparently Crusader. The final courses are of small stones of later periods. The wall at he south-western corner was 37 m high. Three groups of gates are visible in the southern wall of the Temple Mount. The Single Gate, probably dating to4 the Crusaders and repaired by the Mamelukes, is 37 m from the south-east corner of the wall. The Triple Gate is 183 m from the south-west corner and 90 m from the south-east corner. This was the site of one of the two pairs of the Huldah Gates of the Second Temple. The Double Gate is south of the EI-Aksa Mosque, and was the other pair of Huldah Gates mentioned in the Mishnah (Middot 1, 3). During the Second Temple period these two gates divided the Temple Mount wall into three almost equal sections. The courses of the southern wall of the Temple Mount range from 0.75 m to 1.40 m in height. The. twenty-eighth course from the foundation is known as the "grand course"' it is 1.85 m high, and runs from the south-eastern corner to the Double Gate, on the same level as the gate thresholds. The Double Gate can be approached from within the Temple Mount courtyard, at the north-east corner of the EI-Aksa Mosque. Sixteen stairs and a double gallery lead down to a hall whose ceiling is supported by a row of gigantic pillars. From here one can see the front of the Double Gate in the southern wall of the Temple Mount. This underground structure is known as EI-Aksa el-Qadima, or Baq'at el-Baida. The Double Gate, now walled up, is said to be one of the two pairs of Hulda Gates of the Second Temple period. During festivals, pilgrims entered the Temple area from the Ophel square by the Huldah Gates (the gates can be seen in the Second Temple model at the Holyland Hotel). The gate is largely concealed on the outside by a later building; it is 12.8 m wide, and is divided in two by a large pil-lar. EI-Muqaddasi calls it Buab e-Nabi (Gates of the Prophet) and the Persian traveler Nasir i-Khosrau refers to it as Bab e-Nabi (Gate of the Prophet), both meaning the Prophet Mohammed. Mujir e-Din calls it Bab EI-Aksa el-Qadima. Ibn Batuta, the Tangiers traveler who visited the city in 1355, wrote that on three sides of the Temple Mount were many gates, but on the south it had only one gate...by which the Imam entered (according to G. Le Strange. Palestine under the Moslems, p. 182). EI-Muqaddasi calls this the Fountain Gate, since the water brought to the Temple Mount from the Gihon and Rogel springs flowed through at this point. Nasir i-Khosrau noted that this was the gate leading to Silwan (Siloam). The southern gates of the Temple Mount were walled up after Saladin's conquest of Jerusalem in 1187. This was originally a double gate, one of the Huldah Gates built by Herod for the use of pilgrims. Part of the west doorpost remains from the original Second Temple structure. The thresholds of both the Double and the Triple Gates lie some 12 m below the present level of the courtyard. The Triple Gate received its present form during the Crusader period. The Cradle of Jesus, known to the Arabs as Mahd 'Issa, is part the Stables of Solomon. It is reached by way of a staircase near the south-east corner of the Temple Mount courtyard, east of the EI-Aksa Mosque. The chamber measures 21 m from north to south and 17 m from east to west, and the ceiling is supported by columns. In the west wall is an opening decorated with Byzantine art, probably dating to Justinian. In Byzantine times a basilica named after St. Mary stood on the site, with a niche dedicated to Jesus; this is now represented by a dais supported on four small marble columns. Nasir i-Khosrau notes that there was a subterranean mosque at the south-east corner of the Temple Mount, where the cradle of Jesus was, and that he (Nasir) prayed at that place. Re writes that Jesus' childhood was spent there, and this was where he spoke with the people. In the mosque were many lamps of silver and brass, which were lit every night. (Le Strange, pp. 166-67). The Church of St. Simeon stood here in Crusader times. 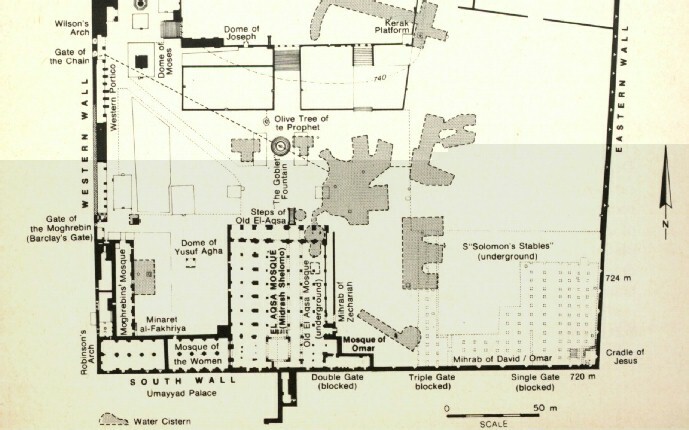 When Herod built the Temple Mount courtyard he made it 485 m long and 315 m wide. The courtyard sloped southwards, and the southern part of the plat-form therefore had to be raised to keep the surface level. Herod filled in only the lower part of the space between the retaining wall and the natural slope, and built the remaining space, to the top of the platform, in the form of vaults, with their ceilings supported by pillars. The south-east corner of the Temple Mount, which had a retaining wall 48 m high, was filled with rubble and soil to a height of 32 m; over this filling was a hall, its roof forming the pavement of the courtyard, and above this rose the upper wall. The walls of the Temple Mount were 5 m thick and consisted of enormous ashlar blocks weighing up to 150 tons. This formidable structure made the Temple into a mighty fortress, unequaled in the architecture of antiquity. Josephus writes (Antiquities XV, 11): ". . . which wall was itself the most prodigious work that was ever heard of by man". The southern wall had a height equal to that of a modern fifteen-story building. Herod constructed two halls with an area of 500 sq. m, the ceilings supported by eighty-eight pillars in twelve parallel rows with thirteen aisles between them, thus raising the level of the courtyard by 12 m. The arches were 9-10 m high, the length of the halls from east to west was 83 m and the width, from north to south, 60 m. There were additional structures which changed the shape of the halls somewhat. The pillars consisted of large, square blocks, over 1 m high; and each pillar was 1.2 m thick. At the bases of the pillars were rings for tethering horses. The Single Gate, now walled up, can be seen at the southern end of the sixth row of pillars, from the east, and the Triple Gate is at the south end of the twelfth row; it is clearly visible from outside the wall. Tunnels and aqueducts were found underneath the Double and Triple Gates, and a drain ran under the halls.